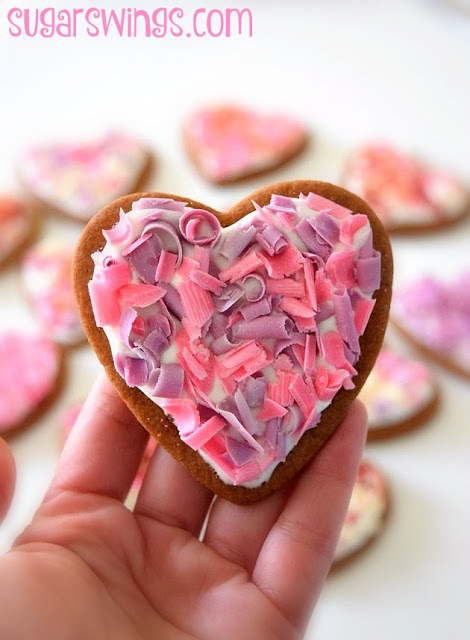 I know I just posted gingerbread cookies for Valentines day last week but I had to share another cookie idea with you all too. 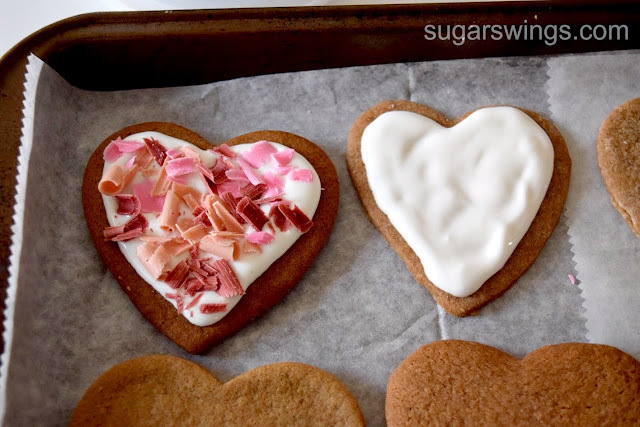 This one also starts with gingerbread cut out cookies. 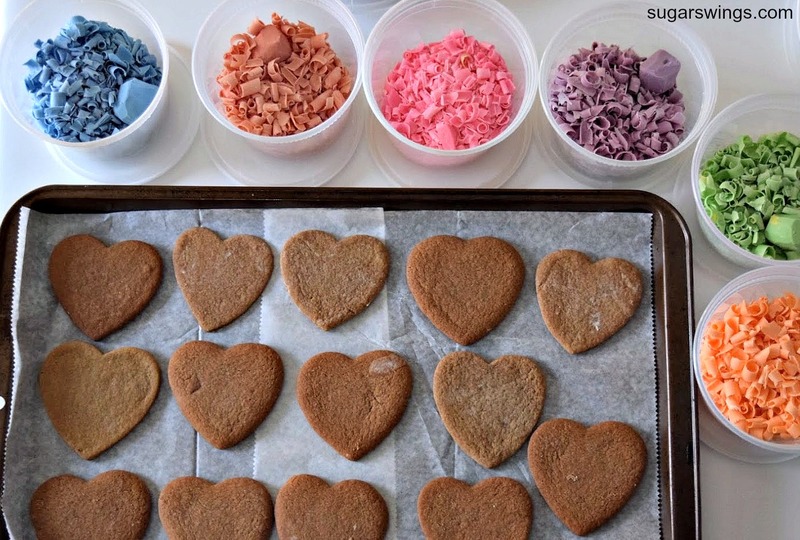 Heart shaped 1) because Valentines Day is this weekend and 2) my kids love gingerbread all year round. Also I saw these cupcakes topped with rainbow white chocolate curls awhile back and its been on my to do list forever. 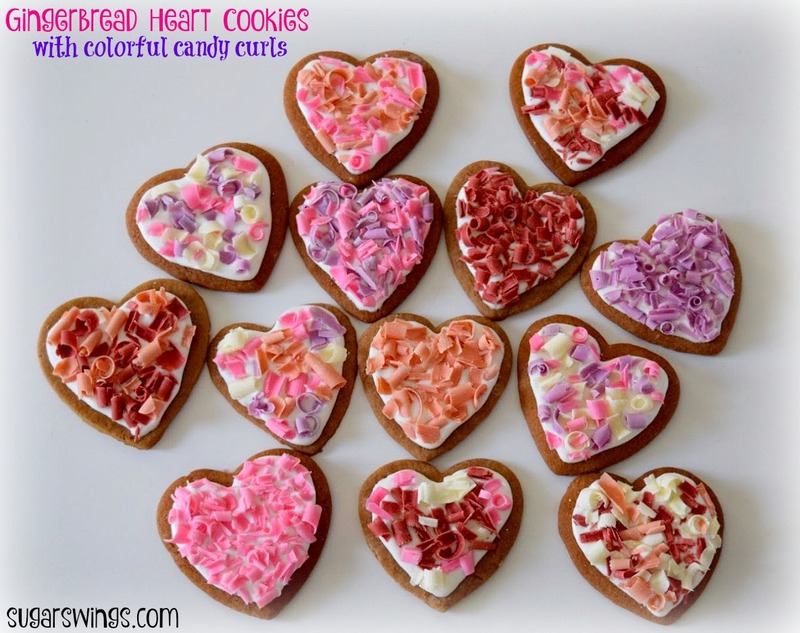 I thought candy curls would be perfect on these cookies. 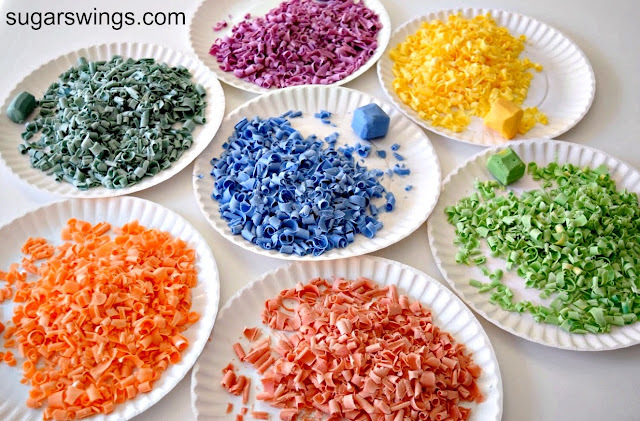 Start with blocks of colorful candy. 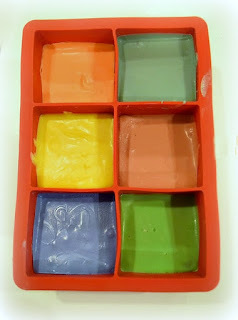 Instead of tinting white chocolate chips, I used candy wafers/melts in various colors. Melt the wafers in the microwave and then add to a silicon ice cube tray. I have a tray for big square cubes that worked great for the candy blocks. Once the candy is hardened again, pop them out of the mold and use a vegetable peeler to make the curls. Keep peeling until the block is gone. It takes some time but worth it and I have plenty left for other projects. Make them in all the colors! Curling the candy was strangely therapeutic for me. Aren't the rainbow colors so pretty?! I decided to add the candy curls to cookies. Add some royal icing and before it dries just sprinkle some of the curls on top. Mix and match as you like - there is really no way to mess this up. If you follow my Instagram you know I'm a bit obsessed with these candy curls! 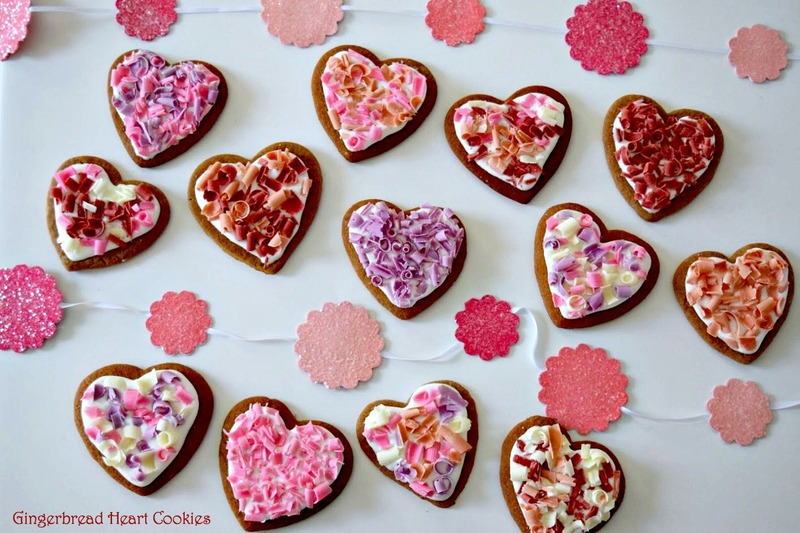 I love the fun and whimsical look they give the cookies. You can use a couple of colors like purple and pink. Or you can go full on rainbow too! Super fun and really easy. I can't wait to make more treats with these rainbow vanilla candy curls. I'll apologize ahead of time for using them in lots of upcoming posts! Oh and happy almost Valentines Day! We are headed out to Park City, Utah this weekend so will be spending Valentines Day with some of our oldest friends AND getting the kiddos up on skis/snowboards in Utah snow. Boarding on powder is way different than on the ice and blown snow here on the East Coast! Enjoy the cookies and thanks for stopping by! 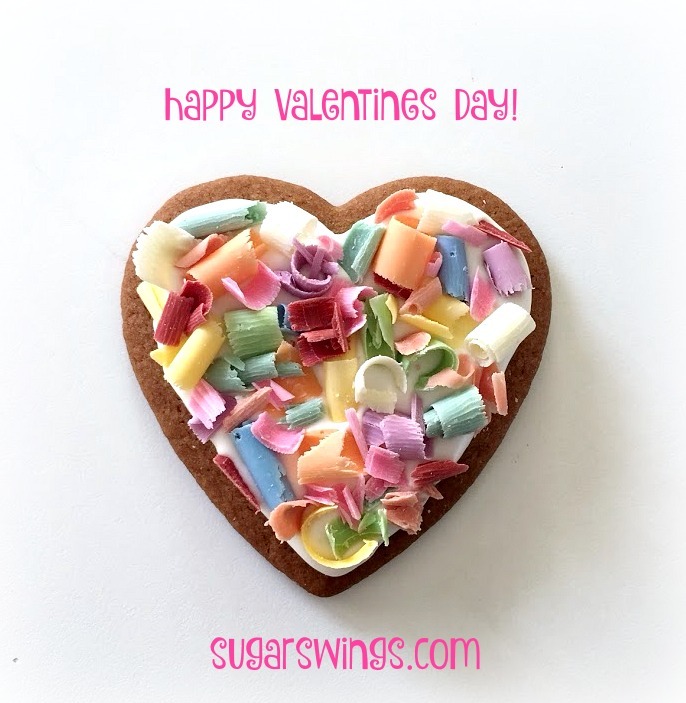 Oh also sharing some fun printables here - there are labels for Valentines day as well as other holiday labels and stickers too. Bonus they are all free! Roll out dough and cut out circle shapes. Use heart cutter to cut out shapes. While icing is still wet, sprinkle the vanilla candy curls. Melt 1 cup of candy wafers/melts in microwave safe bowl in 20 second intervals in the microwave until all candy is melted. Stir in between intervals. 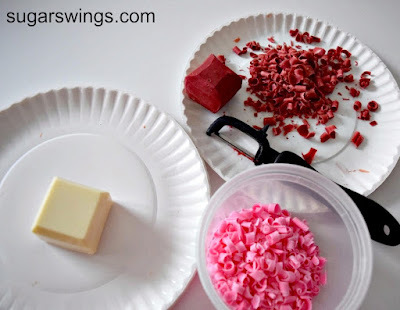 Add candy to silicone ice cube tray. Tap to remove air bubbles. Repeat with each color that you want to make curls. Refrigerate for 15 minutes or until entire block is hardened. Use the peeler and peel long sections (allowing candy to curl as you go). This gets easier as you do more curls. Repeat until the block is all curled.